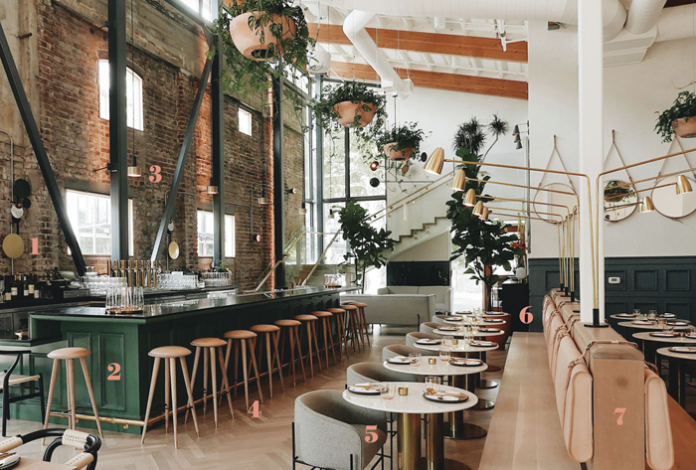 BEAST + BOUNTY, the hot new restaurant in Sacramento’s Ice Blocks development, has been getting rave reviews for its look as well as its food. Michael Hargis, B+B’s owner, handled the design himself, selecting everything from the gold flatware on the tables to the cheeky art photo of a man masquerading as Queen Elizabeth in the entry. Interior designer Nancy Pape came away impressed from a recent visit to the eatery. “It’s designed but not overdesigned,” she said. “It feels so fresh. I love it.” Here, Pape shares her impressions of B+B’s design. 2 The traditional wood wainscoting, with its recessed panels and ogee-edge detail, “is like something you’d see in a library,” Pape said.